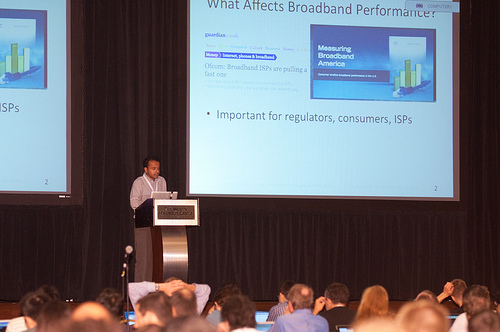 Srikanth presented the first large-scale study of broadband Internet performance at SIGCOMM 2011. The work was a collaboration with the SamKnows/FCC team and included many important findings, such as the contribution of interleaving and forward error correction to last-mile latency, and the role of customer-premises equipment (e.g., DSL modems) in introducing extremely high latency under load. He also presented the BISmark platform at NANOG 53 in Philadelphia and the Internet2 Fall 2011 Meeting in Raleigh. The talks focused on the measurement capabilities of the platform and have led to increased deployments and follow up discussions with service providers to enhance BISmark’s measurement infrastructure. In February 2012, Srikanth presented a talk on Web performance bottlenecks and how to alleviate them at the CAIDA AIMS-4 workshop in San Diego. The talk presented analysis showing how the last mile is a significant source of latency and throughput bottleneck and their effect on Web page load times, and how simple techniques such as DNS, TCP connection, and content caching in the home router can significantly improve performance.